Our world is saturated in color. From pastel hues to neon brights, color is one of the most influential phenomena in our lives. I think that is something to be celebrated and I’m not alone. 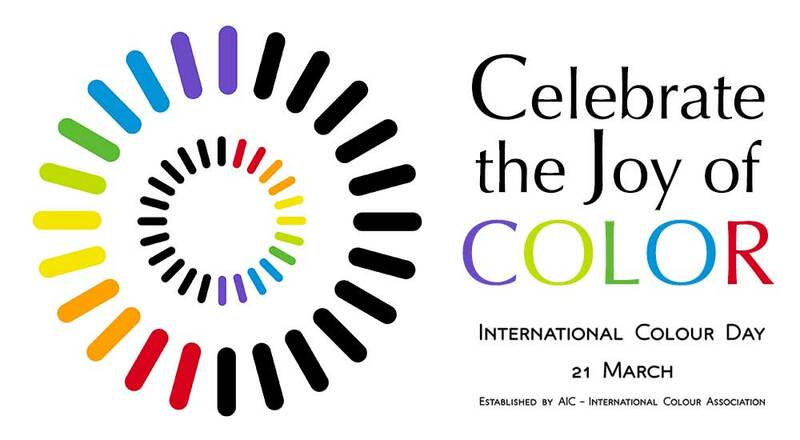 On March 21st all around the world color lovers are taking part in International Colour Day. The logo has equal halves one of rainbow colors and the other black representing the light and darkness, day and night relating to the equinox. The two circles are also symbolic of the form of an eye. Learn about the psychology, symbolism and meaning of different hues. Have some fun finding out how even our language is colored with meaning. Enjoy seeing colorful places around the world or discover how many cities in the United States have color names. Celebrate color by thinking about all the color options you have for your home or your business or you! Or simply enjoy the hundreds of quotes about color I have collected. How do you celebrate color today or any day? March 21st is International Colour Day but if you are like me you enjoy color every day. I work with color as a career but also love to paint, dye fabric, and find creative ways to surround myself with the hues I love. Leave a comment or share a photo here or on Facebook showing me how you enjoy using color. Hi Kate, I love that you’re celebrating International Color Day! I would love it if you could give me your thoughts on our blog posts. I love color, too! Hi Shannon, I enjoyed your posts on color, keep it up! Sea Green is a great color and you make me want to see even more.